No, it isn't just another East Coast Bias, we're just having that much fun. C'mon, did your city host a marathon, pepper the Orioles, and win two postseason games yesterday? Didn't think so. Welcome to The Epicenter . . . The Boston Celtics aren't dead yet, bank on it. The Bulls are young, they're fun, but do you really think they have enough to upend the defending champs, who are down only 1 future hall of famer? It took Derrick Rose having a career game, shooting 12 of 19 from the floor and putting 36 points on the board for the Bulls to win game 1, and the C's still were only a missed free-throw away from beating them. And yes, Ray Allen had to drill a three-pointer in the closing seconds of game 2 for the Celtics to avoid being down 2-0 going on the road. However, it also took a Ben Gordon career game for the Bulls to even be in this one. I'm going to say it, Ben Gordon won't have another 40+ point game where he shoots .583 from the floor and turns the Celtics defense into swiss cheese, not happening. These are the defending champs, they still have Paul Pierce and Ray Allen, they still have one of the top five point guards in the league running the show, slow down on writing them off just yet. 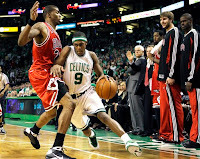 As for that top five point guard, otherwise known as Rajon Rondo, he's quietly having a helluva series. In 84 minutes, the Celtic point guard has scored 48 points, dropped 23 assists and pulled down 21 rebounds. Derrick Rose may have more explosive games from time to time but I'll take Rajon's quiet triple-double any night. North of the border they go, to put their foot on your throat. The Black & Gold aren't waiting to shut down the Canadians back home in Boston, they're taking care of business in Montreal. The Bell Centre was rockin', the Canadians are in a must win game down 2-0, and the Bruins are playing without suspended bruiser, Milan Lucic, it couldn't be more set for the Canadians to get a game back. The Bruins have been here before, you don't let your rival off the mat when you knock him down. This time, stud goalie Tim Thomas, had something to say about that. Thomas shut down Montreal in the final period as the Bruins skated toward a 4-2 victory. Now I don't claim to know much about hockey, but the Bruins seem to be playing way more relaxed and disciplined right now. Early goals, penalties, and even fights don't seem to rattle these Bruins. No matter the sport, if you play like your a champion, you'll be a champion. Warm up the buses kiddies, the Bruins are headed to the second round after they dispatch the Canadians in four. Depth, that's what this is about. When I previewed the 2009 baseball season on The Right Now Podcast, I told you it was about depth, and that is what the Boston Red Sox are made of. Matsuzaka on the shelf with a tired arm, Justin Masterson steps into fold and delivers five innings of four hit baseball. David Ortiz looking like he's turned 60 this past year, Dustin Pedroia goes 4 for 6 on Patriot's Day. Jed Lowrie on the mend, Nick Green steps in with a game-winning run on Sunday. John Smoltz has yet to suit up for the Red Sox, they've got a minor leaguer named Daniel Bard whose only thrown 8 innings and struck out 13 in Triple A ball. The Red Sox are deep and that's what will keep this team in it throughout the 162 game season, you can bet on that my friends. While Chien-Ming Wang is giving three touchdowns in New York, the Red Sox are wondering which ace in the whole they'll play next. See you in October. Did the world really think we'd go another year without a championship parade? I don't know about you, but I'm ready for a early summer parade carrying that silver cup through the streets of Boston. The Epicenter is alive and well.